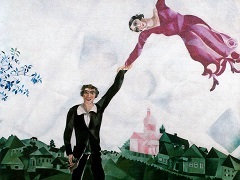 Window in the Country was painted during August 1915 in Zaolcha, a hamlet in the neighborhood of Vitebsk. 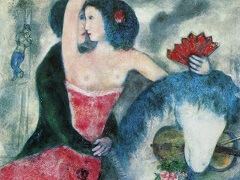 On July 25 Chagall had married Bella, the love of his youth, and they spent a happy summer month together in a country house there. From the kitchen window at the rear could be seen a thick little birch grove. The view from this window, over the flowering hedge toward the birch grove, during high summer, is the subject of this picture. "Woods, pine trees, solitude. 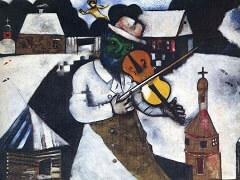 The moon behind the forest," is how Chagall recalls his stay in Zaolcha. How he saw himself there, how he lived and dreamed, is told in his painting The Poet Reclining. 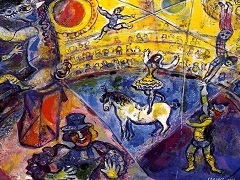 It shows the painter lying in the grass with his palette as headrest; behind him is a fenced meadow and a row of stables, in front of which a horse and a pig are grazing, and a pine forest encloses the peaceful idyll. 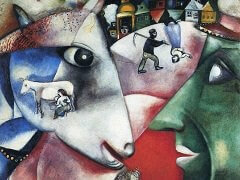 Chagall loved to look out on a scene; there is a picture from as early as 1908 showing a landscape seen through a window. 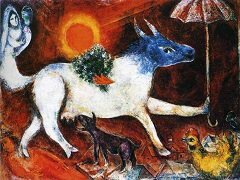 Chagall was always shy of working in front of uninvited onlookers and preferred to paint views from inside his various workrooms. 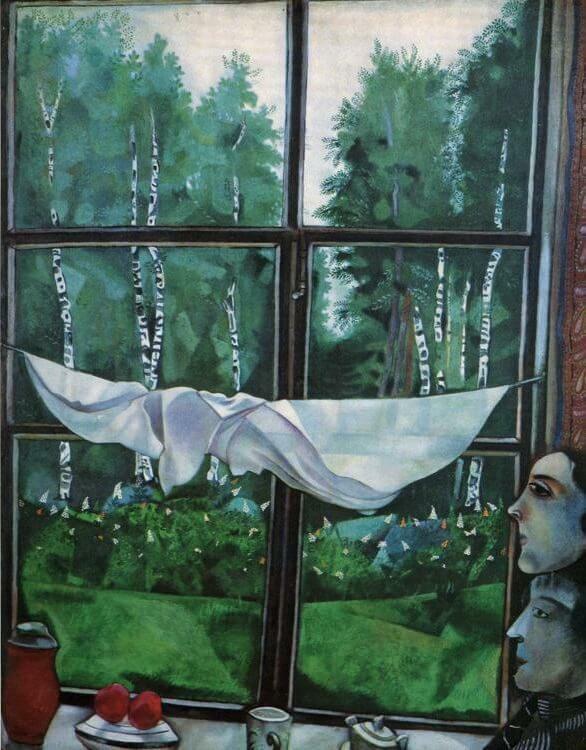 The loveliest of his landscapes from the years back in Vitebsk are window views of the kind shown here. They offer a poetic contrast between the sheltered domestic intimacy inside the room and the pageant of free nature outside; it is just this kind of contrast which gives the picture here its special atmosphere.